As much as we like the thought of enjoying an elevenses snack with co-workers, the sad reality of our frantic, modern working world is that we're lucky if we are able to stop by 2:00 for a quick lunch. So, we need something for breakfast that will keep us fueled — other than stress and caffeine. 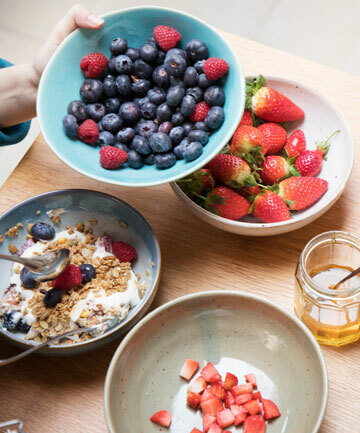 That comes down to choosing the right breakfasts that won't leave you feeling lightheaded long before it's properly lunch. Grand Resort Bad Ragaz nutritionist Sonja Ricke says that there are two types of people: those who are fine with two meals a day and those who need three meals. If you're here, you're very likely in the latter category. She says that it is essential to eat the right amount and the right combination of proteins and carbs with nuts for breakfast. "Generally, having either just proteins or just carbs won't fill you up for very long," Ricke says. "It's the combination that is key." Sorry, cereal lovers, but sugary foods are best avoided. Some filling breakfasts that meet the ratio include roasted sweet potatoes with egg or cheese, green smoothies, savory porridge with egg and millet cooked in milk and topped with apples and hazelnuts. No matter what you have for your main breakfast dish, Ricke suggests adding one handful of seasonal fruit because its vitamin C will help absorb iron found in other foods. Read on to see 16 satisfying breakfasts that will keep you going and going.